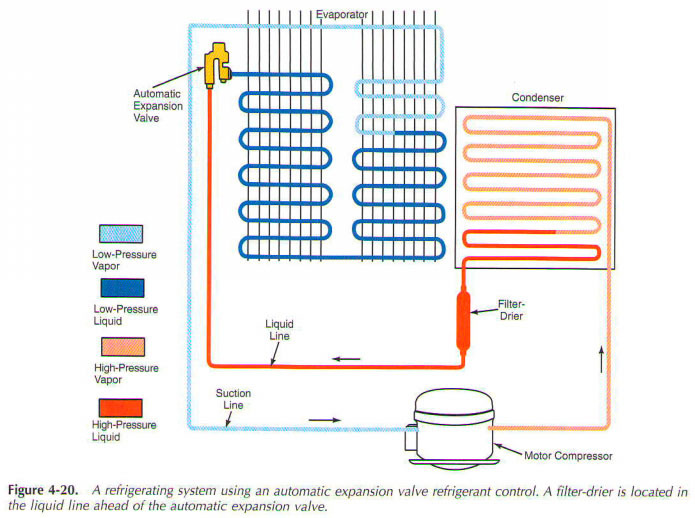 One of the dry system uses an automatic expansion valve (AEV) refrigerant flow control, Fig. 4-19. This valve can only be used at a temperature of-wheel motor control. As the pressure falls on the low side, the expansion valve opens and liquid refrigerant enters the evaporator. It absorbs heat, and then evaporating under low pressure. 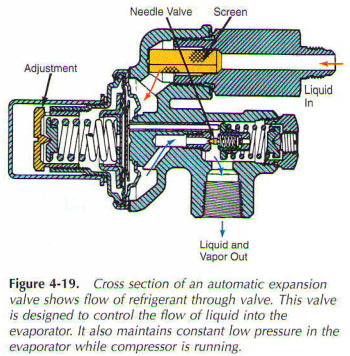 Valve maintains constant pressure in the evaporator in a running system. This system operates independently from the quantity of refrigerant in the system. In AEV is a division point between the high-pressure and low-pressure sides of the system. Automatic expansion valve, Fig. 4-20, can be adjusted to the correct pressure in the evaporator. Accordingly, spinning clockwise increases the speed of the flow, thereby increasing the low-pressure side. The speed of the refrigerant flow through the AEV is controlled by the evaporator. Refrigerant will not flow through the valve while the compressor is running. Evaporator should also be under low pressure refrigerant flow. Remember, lowering the pressure in the evaporator, lowers the temperature in which the refrigerant evaporates.